Grove Innovations, makers of the Hot Rods cranks that are so exquisite, also makes a number of unique replacement parts. Their Mountain stem is unique in it's design, the amount of workmanship in it's manufacture, and the absolute beauty in the finish work. Made of several pieces 4130 Cro-moly tubing, the Mountain stem employs a double expander system to hold the stem to the fork. The vertical stem body is made of 1.5mm thick tubing, with a 22.2mm inner diameter. The extension is made of flat ovalized Cro-moly tubing with a deep miter cut that wraps half way around the body. The 41mm wide extension oval is welded to the 25.9mm wide stem body which would leave two exposed half round holes on each side of the body. Grove welds small plates over these half-round holes, and grinds the welds smooth before they join the extension to the body. The detail is taken care of. Grove uses flat oval tubing for the extension to make the broadest possible contact to the 47mm wide binder tube and because it offers superior lateral stiffness when climbing. The 3mm at each side leaves room only for welds, finish work and painting. 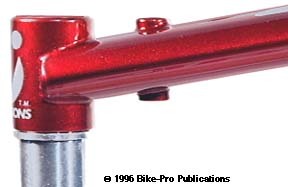 The Grove Mountain stem uses two binder bolts. 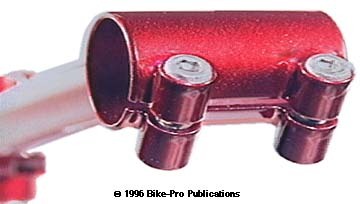 The binder fittings are made of machined Cro-moly rod that's carefully drilled and tapped for the binder bolt with the back contoured to lay flat against the binder tube. The binder fittings are brazed on, giving a solid metal joint, all around, and underneath the fittings. The front of the stem is then cut through to create the binder system. Notice how little room there is for error drilling to seat the bolt. The Grove Mountain stem uses Top routing for the brake cable. A hole drilled through the extension permits a machined Cro-moly rod with a 6mm hole from the top to near the bottom for the cable and housing. At the bottom it becomes a 2.7mm hole for the bare brake wire to exit. The Top route tube is brazed parallel to the vertical line of the quill. 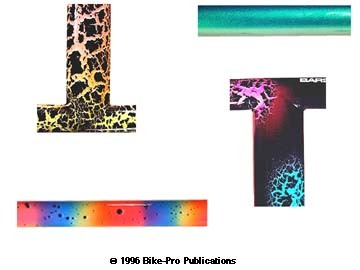 The body, extension, and binder tubes are TIG welded using small, deliberate, smooth, inconspicuous, even beaded welds, which don't draw your eye from the beauty of the stem. 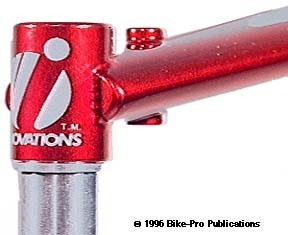 The stem is painted with an activated wet paint, then Grove decals the back of the body and the top of the extension with an artistically styled version of their logo, after which it's painted with a clear top coat that delivers an even smooth finish to the entire stem. The double expander quill slides into the body of the stem and into the fork steerer. A single 6mm allen head bolt is turned which draws up both expander pieces, tightening the stem to the quill and the quill to the fork. The quill is made of a single piece of aluminum rod that is turned on a lathe to reduce the top stem expander to 22.2mm and the bottom to either 22.2mm for the 1" fork, 25.4mm for the 1 1/8" or 28.6mm for the 1 1/4" diameter fork. In each of the sizes a shoulder is left so that just the top of the quill is exposed, flush with the top of the stem body. After the piece is turned, it's drilled from top to bottom creating the travel hole for the expander bolt. The drilling leaves a recess in the top of the quill for the bolt head and a smaller diameter hole at the bottom to be tapped for the bolt threads. Once the threads are tapped, the piece is given two diagonal but parallel cuts to produce the wedges for this double expander system. The Grove Mountain stem is available in either a 10 degree or 30 degree rise, in 135mm or 150mm extension length, with quill piece to fit a 1", 1 1/8" or 1 1/4" fork. The colors available are high gloss Black, Day Glow Orange, Wineberry (a fine, glossy, metal flake Burgundy), Purple Passion (a deep, glossy purple), Emerald Green (a fine, glossy, metal flake emerald green), Tie-Die (neon pink with rainbow sprays of neon blue, yellow and green), Neon Solar System (neon yellow, blue and pink with a glossy black sprayed over the stem that reveals the underlying colors through a cracked surface in the black, then clear coated), other wild colorations are available because Grove does small custom runs on the painting of their products. Please call us for recently released, unique paintings that we may have on hand. The weight of a 150mm stem, 10 degree with the 1" quill is 363 grams. A 135mm, 30 degree rise with a 1" quill is 344 grams. Using the 1 1/8" quill with either of the stems adds 24 grams, and use of the 1 1/4 quill adds 39 grams to their weights.